The vermintide washes over the Mortal Realms. 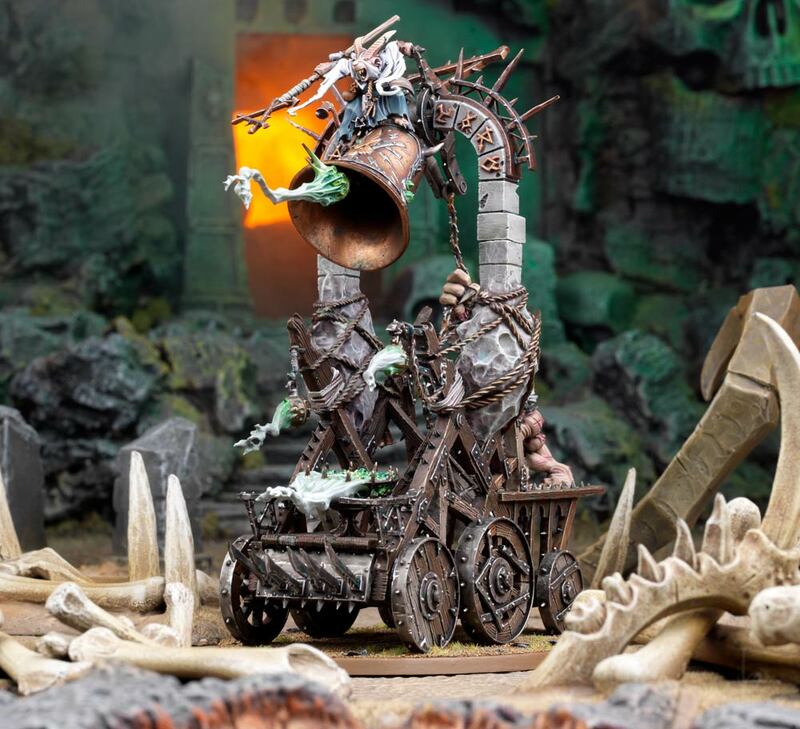 How fitting that the 13th Faction Preview for Age of Sigmar should be the Skaven. Let’s take a look at what the legions of the Horned Rat can do. The Skaven have shown their furred, fanged faces–and like many of the factions, they’re getting some improvements come the new edition. Most notably there’s the ability to combine command traits, which allows you to stack enough buffs that even a unit of clanrats can get the job done on the tabletop. After all, anyone rerolling 1’s to hit and wound and getting an extra attack is glad for it. But on top of that, they get some powerful new toys in the latest edition. Let’s take a look. The skaven are a verminous race of rat-men from the darkest depths of the Mortal Realms. Hateful and bitter creatures, the skaven are wretched and cowardly alone – but, through weight of numbers and low cunning, they have undermined countless empires. 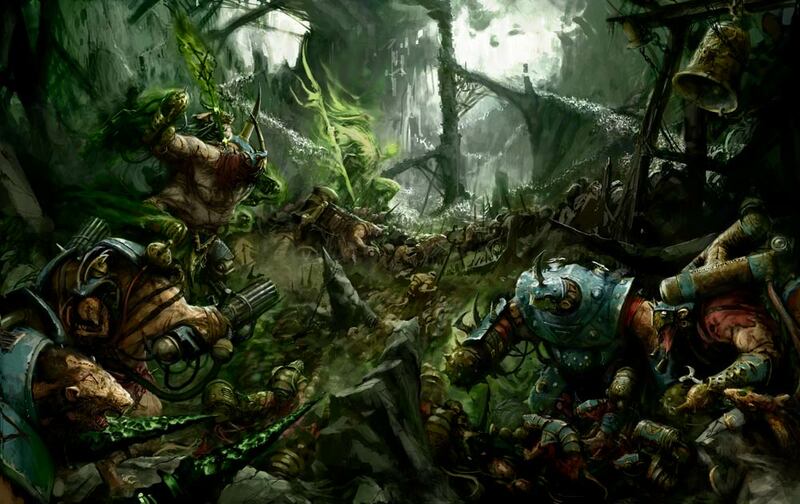 Organised into a number of great clans – like the technologically advanced Clans Skryre or the flesh-crafters of the Clans Moulder – the skaven are one of the most insidious threats in the Mortal Realms – to underestimate them is to court certain doom. Thanquol and Boneripper have been reduced to the point where they’ll comfortably fill out an Allies choice in a 2000 point matched play list. 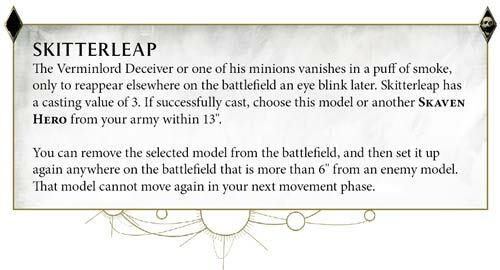 If you’re feeling particularly devious, use him in an Eshin army and cast Skitterleap on him with a Verminlord Deceiver to drop this deadly duo 6″ away from your unfortunate foes – just in range of their brutal Warpfire Projectors. Further, the Skaven are poised to take advantage of the new summoning rules. 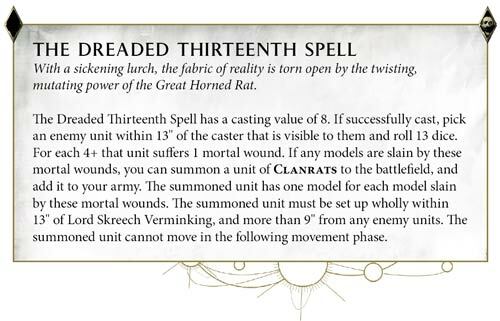 The Verminlord has access to the Dreaded 13th Spell, which turns your enemies into allies, twisting and reshaping them into clanrats enough to fell an empire. And of course the screaming bell is ready to bring all kinds of ruin upon those that hear it’s sonorous screeches. If rats flee a sinking ship, what does it mean if they start swarming back onto it?